North Korea has agreed to hold talks with South Korea this week, a day after it test-fired short-range missiles. 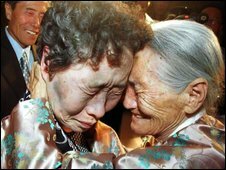 The talks will be on how to avoid cross-border flooding, and arrangements for reunions between family members divided by the Korean War. The agreement to the talks came amid reports that the North may be preparing to launch more short-range missiles. The North is under pressure to return to international talks about ending its nuclear programme. It launched five surface-to-surface KN-02 rockets on Monday, and the South Korean news agency Yonhap has reported that a "no-sail" zone has been declared off the North's east and west coasts for the period from 10-20 October. 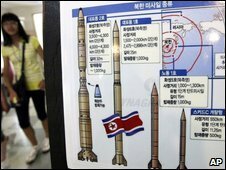 Yonhap said there were signs the North was preparing to launch more short-range missiles off the east coast on Tuesday. "There have been indications that the North is getting ready to fire short-range missiles from the west coast," Yonhap quoted an unidentified government source as saying. At the same time, North Korea accepted the South's request for talks on flood prevention on Wednesday and discussions on humanitarian issues including family reunions on Friday, Seoul's unification ministry said in a statement. Ties between North and South Korea have been frosty since South Korean President Lee Myung-bak linked progress on the North's dismantling of its nuclear programmes to aid deliveries. However, the North has appeared willing to tackle humanitarian issues, and their joint running of the Kaesong industrial plant, in recent months. South Korea wants to find ways to prevent floods after the North on September 6 released millions of tonnes of water from a dam across the Imjin river, sweeping away six South Koreans camping or fishing downstream. The North said a sudden surge in the dam's water level prompted an emergency release and the South's Defence Minister Kim Tae-Young has said there was no evidence of a deliberate "water attack." But the deaths sparked anger in the South and threatened to hurt the recently improving cross-border relations. The family reunion programme, managed by the Red Cross, was on hold for almost two years but tearful reunions were held two weeks ago and the waiting list for relatives hoping to see long-lost loved ones is very long. Last week the North told visiting Chinese Premier Wen Jiabao it was willing to return to the six-party talks, but only after direct negotiations with the United States to improve "hostile relations". Mr Wen has said Pyongyang hopes not only to improve relations with the United States but also with Japan and South Korea. Washington has said it is open to bilateral talks but only in order to bring the North back to six-party negotiations, which are hosted by China and also group the two Koreas, the United States, Russia and Japan. The UN passed tougher sanctions against North Korea in response to an underground nuclear test in May. Pyongyang's recent willingness to return to talks it pulled out of in April may be due to it feeling the pinch of the international sanctions, some analysts say.